When you load a style that may have originated on a different keyboard, the One Touch Setting (OTS) voices used on the original keyboard may not be available on your keyboard. In this case, the OTS voice will be shown as "unknown". Here are some tips on how you can replace the missing voice with one from your own keyboard. As an example, I'll discuss changing missing voices in a Genos style to voices from your own keyboard. First, select an original Genos preset style, for example, "00sBoyBand". Open Michael Bedesem's MIDIPlayer program in your personal computer and load the style you want to work on through the File > Add/Open option (see Image1 below). The Top Instrument given in this program is TYROS4. 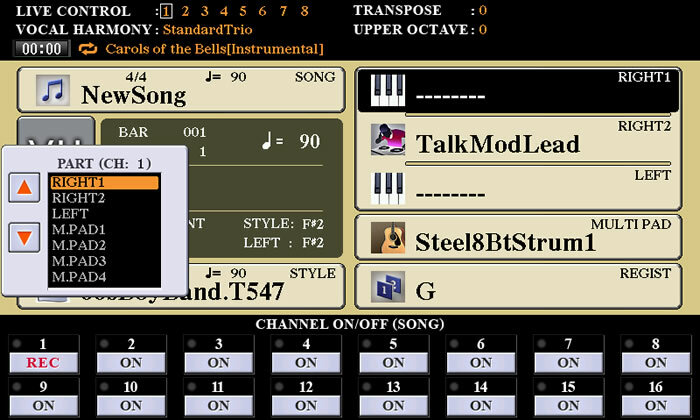 The MIDIPlayer program does not cover the TYROS5 or Genos keyboards. Go to the OTS view as illustrated in Image2. Here we can see that alternative voices are assigned for all unknown voices. The alternative voices assigned may or may not be anything like the original voices from the Genos. 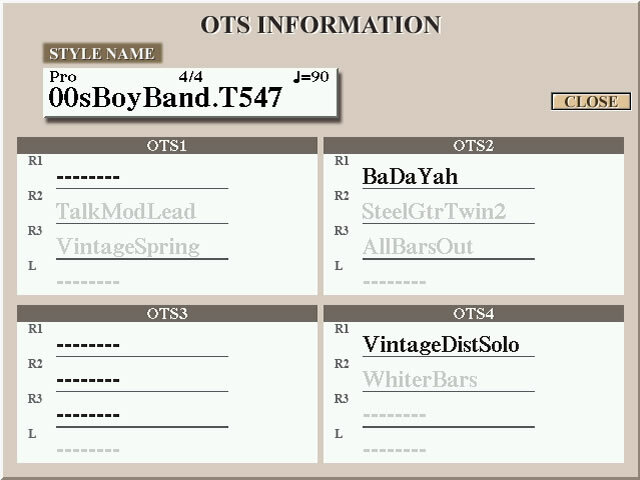 When I opened the same style in my PSR-S970 and viewed the OTS INFORMATION screen (see below). The four rows display the four OTS settings (1-4) for the RIGHT1, RIGHT2, and LEFT voices. The dashes indicate that most of these voices are unknown to the PSR-S970. Joe Waters followed these steps on the Tyros5 and provided images from that keyboard to supplement this article. 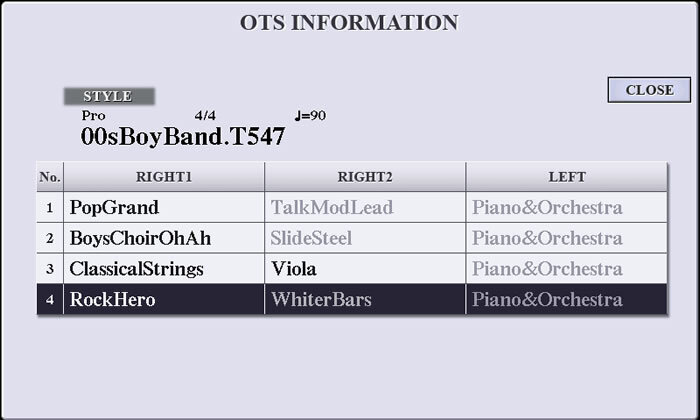 The OTS INFORMATION screen on the Tyros5 is shown below. Each OTS setting has its own box displaying the voices. Bold indicates a voice is ON. Some of these voices are recognized by the T5, but RIGHT1 in OTS1 is unknown and in OTS3, RIGHT1, RIGHT2, and RIGHT3 are unknown. In all four, the LEFT is unknown. When I selected the OTS1 button and pressed the keyboard keys, the S970 played a Piano sound. Some unknown voices may not sound at all. How are you to discover the original Genos Voice? These are the steps I used. First, make sure to save this style in the USER area of your keyboard. Select the desired OTS button. Then view the MAIN window of your Keyboard. The screen shot below is the MAIN window of the PSR-S970. The Right1 voice is unknown. Although it gives a piano sound when you press the keys. we do not know exactly what voice is being played. A list block appears for selecting the PART (RIGHT1, RIGHT2, RIGHT3, LEFT, etc) as we desire. Here, I selected RIGHT1 and then pressed the [F] button (at right-hand side of the display) to select the RIGHT1 voice. (In this style, there is no need to change the RIGHT2 voice since TalkModLead is already there. The LEFT voice also appears as unknown in the MAIN window). When the Recording is ready, press any one of the keyboard keys eg. 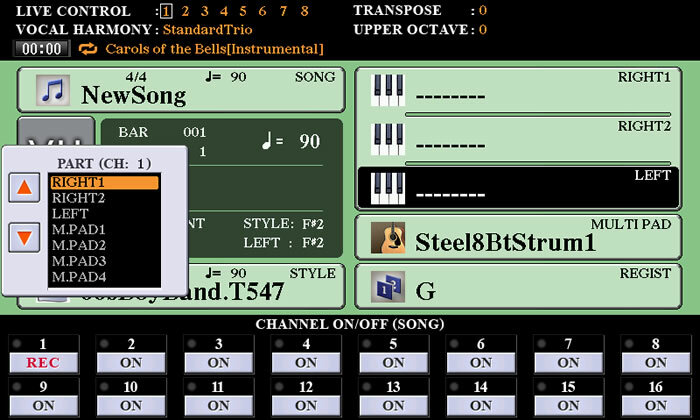 'F3' and immediately exit from recording by pressing the STOP button of the SONG Mode. In the next step, we go to the SONG CREATOR to edit the midi file we just created. 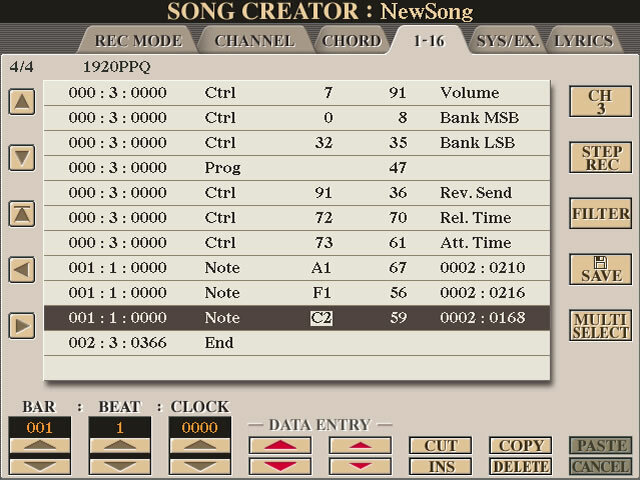 For those unfamiliar with song creator, here are some notes from the S970 Reference Manual. 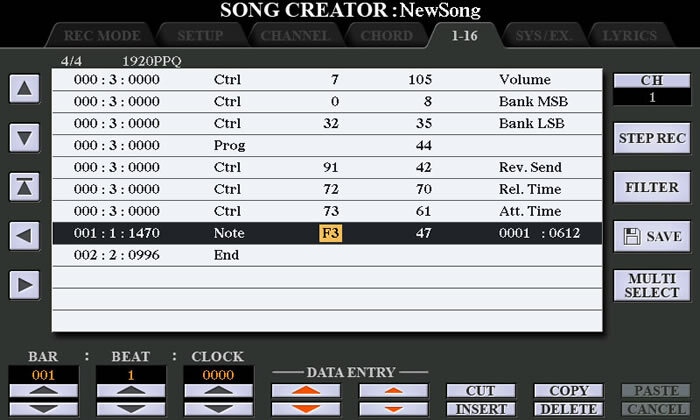 The SONG CREATOR allows you to view and edit the individual "events" in a MIDI song. The Song creator display has 7 tabs (REC MODE, SETUP, CHANNEL, CHORD, 1-16, SYS/EX, LYRICS). The last four tabs are for editing events (chord events, note events, System Exclusive events, and lyrics) and all have a similar "Event List" display. The "location" of the event in the song (bar, beat, and clock) is shown on the left. The next column shows the "type" of event. The remaining columns indicate the event value(s). Note - An individual note within a Song. Includes the note number which corresponds to the key which was played, plus a velocity value based on how hard the key is played, and the gate time value (the length of a note). Ctrl (Control Change) - Settings for controlling the Voice, such as volume, pan, filter and effect depth. 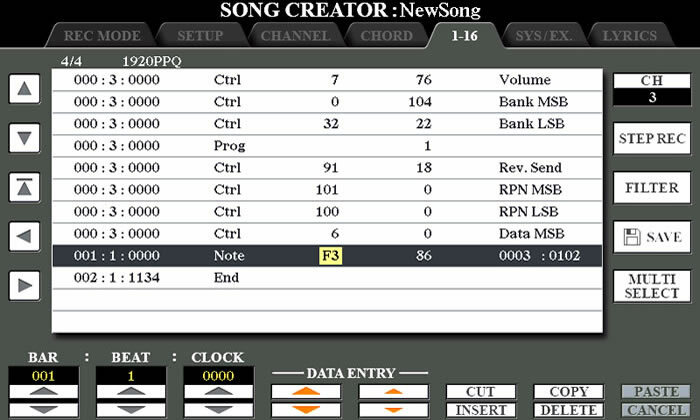 Prog (Program Change) - MIDI program change number for selecting a Voice. 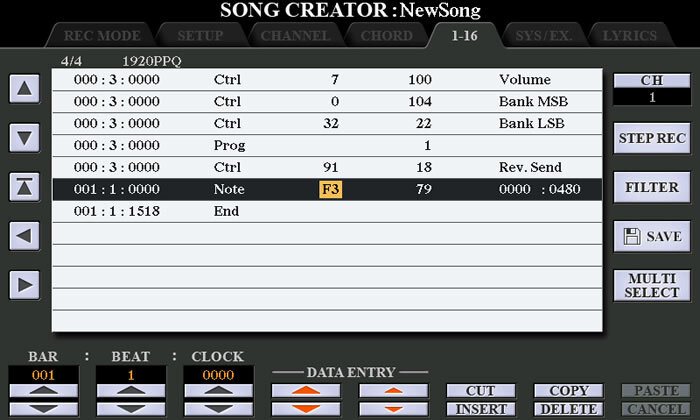 Go to the SONG CREATOR mode and use the Tab button to go to the 1-16 tab (see S970 screen image below). 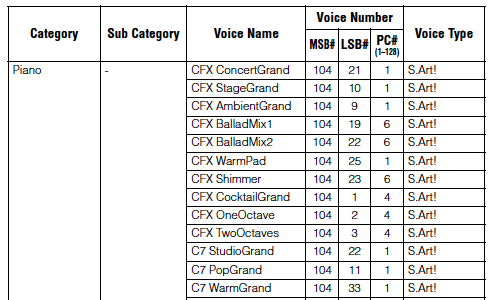 From here, we can see the Ctrl and Prog events that determine the voice being used for the note played: MSB (104), LSB (22) and Prog (1). Here is that 1-16 Event List image on the Tyros5. The first time Joe tried this, the Ctrl and Prog events wer not displayed on this tab. However, note that FILTER button. Pressing it brings up a FILTER display where you can select the events you want displayed. Make sure CONTROL CHANGE and PROGRAM CHANGE are selected. Open the Genos Data List publication and examine the Voice List table (see image below). Each voice is listed and the information includes the Voice Number data but the list is organized by voice category, Sub Category, and Voice Name, which is not listed alphabetically. Examining the list, we find the S.Art! C7 StudioGrand parameter value is 104-22-1, which indicates the MSB(104)-LSB(22)-Program(1). I noted this value in a notepad. That voice, of course, is not available on the PSR-S970, so I selected a voice that was available and might be similar to the C7 StudioGrand voice. 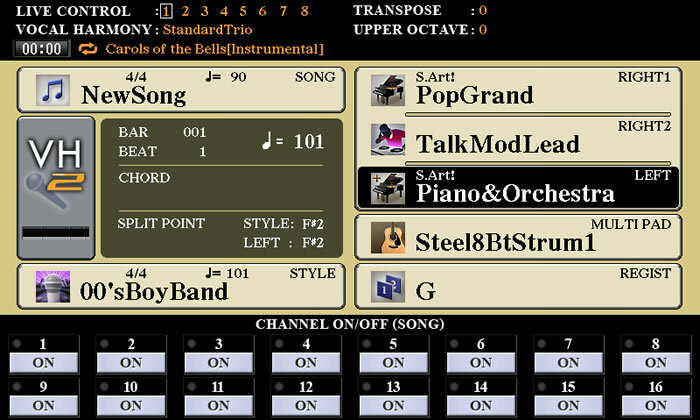 The S.Art!PopGrand (104-11-1) or the S.Art!PianoOrchestra (104-12-1) may be suitable. I then exited the SONG CREATOR mode and returned to the MAIN Window. As it turns out, finding a voice with the paramaters 104-22-1 in the Genos voice list was relatively easy because that voice was listed right toward the top of the first page of voices. There are 12 pages of voices. Counting all the preset voices, legacy voices, and megavoices there are over 1,700 voices available. All three paramaters are required to find the correct voice. There are 8 voices that have MSB=104 and LSB=22 (S.Art C7StudioGrand, S.Art CFSBalladMix2, HomeOrganHorn, 80sUnisonBass, TrancePicks, Pulse&Saw, HybridPad, and StraightRaver), but only one of these, S.Art C7StudioGrand, has PC=1. To facilitate his own search for voices, Joe created a sortable Excel file of the Genos Voice list and the Tyros5 Voice list. You can download these excel files and sort on any of the columns, including MSB, LSB, and PC, to facilitate looking up Genos or Tyros5 voices. I did the above process for the LEFT voice also (sometimes other parts except RIGHT1 may be OFF. So turn on that particular part in Part ON/OFF under the Voice section and do the recording method as mentioned above. For that LEFT voice, make sure the LEFT voice is ON, go to start of your midi file, turn REC on with CH1, in the PART box make sure you select the LEFT voice, play a note and then STOP the recording, go to SONG CREATOR, tab to 1-16, note down the MSB, LSB, and Program. After viewing the unknown voice parameters make sure to turn the part off in Part On/Off, if that particular part is in Off. In this example, the LEFT voice also indicated that the Genos S.Art! C7 StudioGrand voice was used. Then coming back to main window, I pressed the [F] button (Right1) and I selected S.Art! PopGrand voice under Piano section. I then pressed the [H] button (for the LEFT voice), and selected the S.Art!Piano&Orchestra voice. Then I pressed the Memory button under Registration Memory section and immediately press the OTS1 button, a comment will appear "OTS has been changed... Save now?" press YES and save that style. The OTS settings are saved directly in the style. That edited style will be saved in the User area. Viewing the MAIN window, the RIGHT1 and LEFT Voice are OK now as in the image below. OTS3 has unknown voices for RIGHT1, RIGHT2, and LEFT. In working on this article, I have discovered an alternative method that can be used to discover the voice paramaters for all these missing voices at once. We will make a short recording, as above, but with all of the voices ON. The screen shot below is for the S970 and shows all three voices selcted and ON. 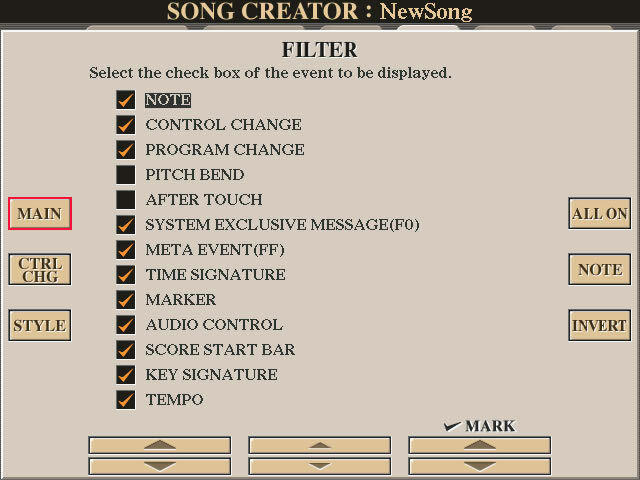 Go to quick recording to create a new song. Press REC plus CH:1 and select RIGHT1 voices to go to Channel 1. See image below. Now, press REC and CH:2 to select the second channel and assingn RIGHT2 to this channel. Note in the image below that both CH:1 and CH:2 now are set to REC. Note that if you are doing this on a Tyros5 or a Tyros4, you could record the RIGHT3 voice to CH:3 and then record the LEFT voice to CH:4. 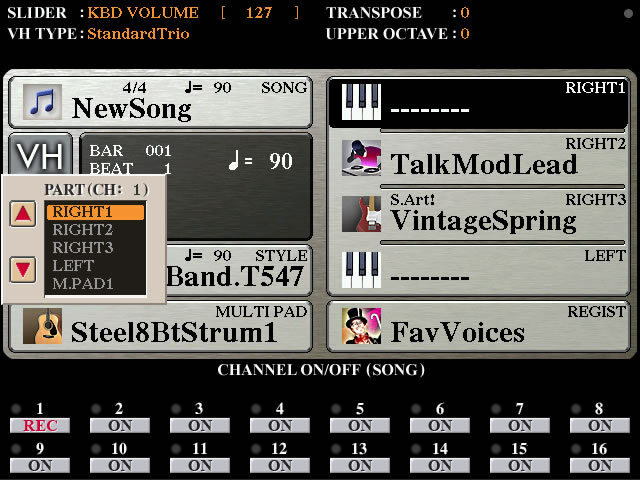 Now you can start your recording by, for example pressing "F3" with your right hand and also pressing "F2" with your left hand to make sure you are recording both the right-hand and Left hand voices. 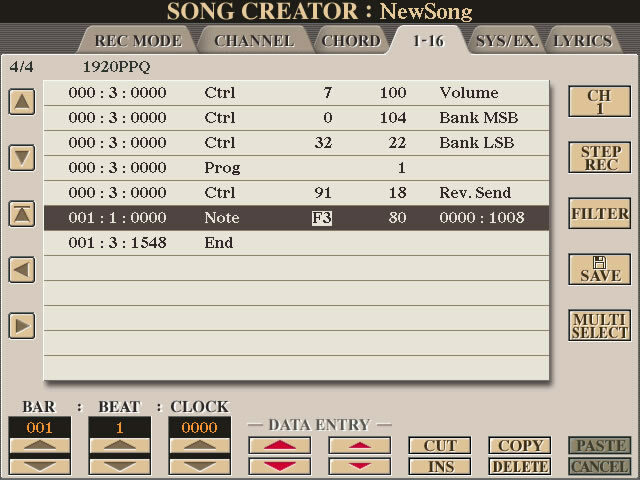 Press the STOP button to stop your recording and then go to SONG CREATOR. Tab over to the 1-16 tab for editing note events. You are viewing CH:1 results. You can see the note played (F3). You also see the MSB (8), LSB (35), and PC (44). Jot these down on a notepad. Press the [F] button to the right of the CH:1 display. This advances you to a view of CH:2 results. the same note is played, of course, but there is a different voice with MSB (8), LSB (35), and PC (46). Jot this information down for the RIGHT2 voice. Press the [F] button to advance to the CH:3 results. For the LEFT voice we see MSB(104), LSB(22) and PC(1). The LEFT voice is the same as was used in OTS1. Using the technique above on the Tyros5, Joe recorded the RIGHT3 voice to CH3 (see screen shot below). The information shown identifies the Genos voice as 8-35-47, which is the SA KinoStringsCellos. 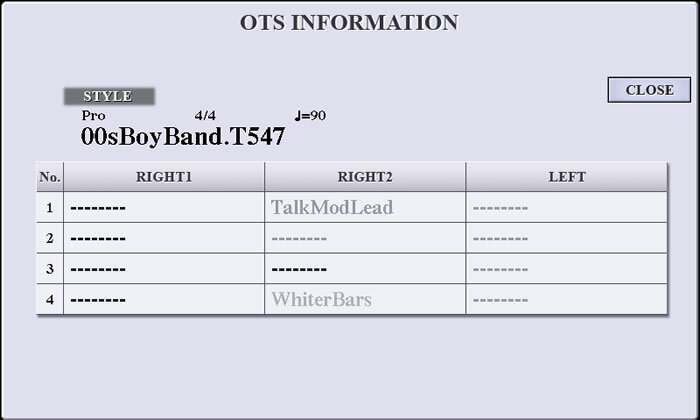 The table below shows the original Genos voices for OTS3 and alternative voices for the S970 and Tyros5. Tyros4 owners can use the S970 voices. Although there is no way to view the RIGHT3 voice in PSR models, there is another way to determine the voice parameters using Michael's Bedesem's StyleDump program. 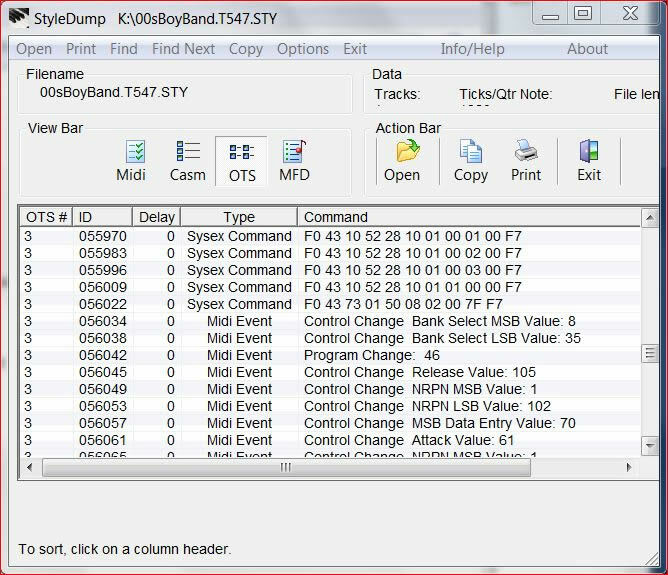 The screen shot below shows the OTS from the 00sBoyBand style loaded into StyleDump with the OTS button selected. Scrolling through the list of commands, look for the Command line starting with "Control Change Bank Select MSB Value:". You will find the MSB, LSB, and Program Change values listed together. For each OTS, the voice parameters are shown for RIGHT1, further down the list, RIGHT2, and further down RIGHT3 and then, eventually LEFT. In the screen shot below, you see the lines for MSB(8), LSB(35), and PC(46). NOTE: In PC MIDI-based programs, all the parameter values are the same as MIDI implementation chat. However, the Program Change numbers are minus 1 from those listed in the Keyboards and Data lists. If it is 0 in PC, we have to consider it as 1 in the Datalist and in the keyboard. If it is 46 in the PC, we have to take it as 47. The 8-35-46 shown in the StyleDump listing would be 8-35-47 in the Genos Data List, which would indicate the SA ClassicCellos. This change was made from the year 2004 (after the PSR-3000). 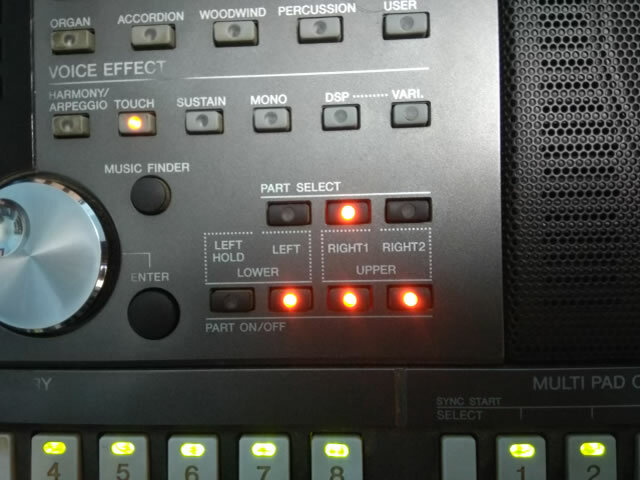 For earlier keyboards such as the PSR-2100(2003) or TYROS(2002), the Program Change values in the keyboard data list are the same as per PC MIDI-based programs. If we compare the TYROS 5 Data List and TYROS Data List, we can see the difference. For example, the Live!GrandPiano is given as (0-113-1) in T5, whereas it is listed as (0-113-0) in the T1. Repeat these methods for each of the OTS slots. Deterimne the Genos voice, select an equivalent PSR-S970 voice, save it in the OTS button and save (overwrite) the revised style each time. After completing, all unknown voices are now replaced with S970 voices. Image 7 below displays the OTS INFORMATION for the updated style with the alternative voices I selected. Finally, save that style in an external devise (USB drive). 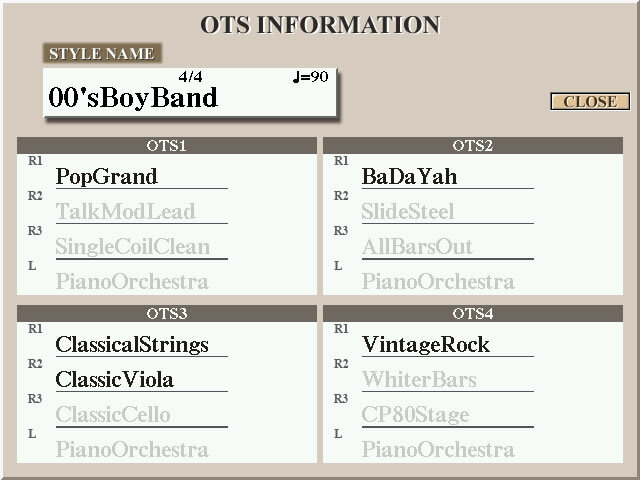 Below is the final OTS Info screen from the Tyros5. The R3 voice on OTS4 was unknown. Examining it using SONG Creator determined that the Genos voice was 104-10-3, the CP80-ElectricGrand. For the T5, the CP80Stage voice was used as a suitable alternate. If you want, it is possible to load a new voice, but keep the voice effects that were set for the unknown Genos voice. When you load one of your preset voices in RIGHT1, RIGHT2, or LEFT, you also load all the default voice setting parameters that are linked to that voice. You can, however, disable this feature. Go to the the VOICE SET FILTER display. On the S970, go to FUNCTION, tab to MENU1, select VOICE SETTING and tab to VOICE SET FILTER. See the screen shot below. When the options are set to ON, the corresponding parameter settings are called up automatically with the voice selection. So, if you wanted to change a voice, but keep the same EFFECT settings, you would turn OFF the EFFECT for that voice. 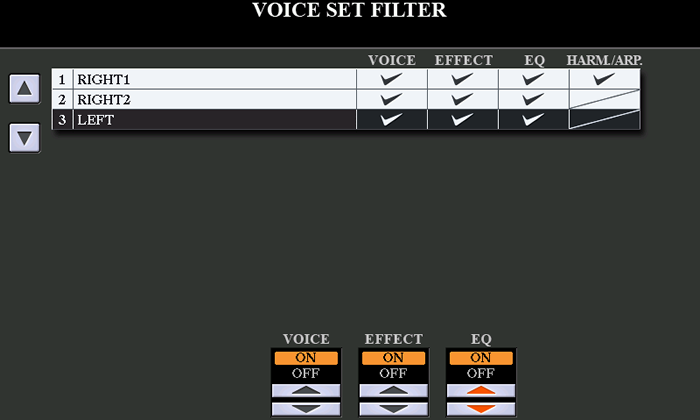 So, to keep the current Genos voice effects for the RIGHT1 voice, set the EFFECT option to OFF before loading your alternative voice for the RIGHT1 voice. On the Tyros5, go to the FUNCTION MENU, and press [F] button to select REGISTRATION SEQUENCE/FREEZE/VOICE SET. Tab over to VOICE SET display screen. Use [A] and [B] buttons to select voice and then use the buttons at the bottom of the screen to turn options ON or OFF. This page updated on April 7, 2019 .